The latest GuideSIGN™ version sets a new standard for flexibility and versatility. 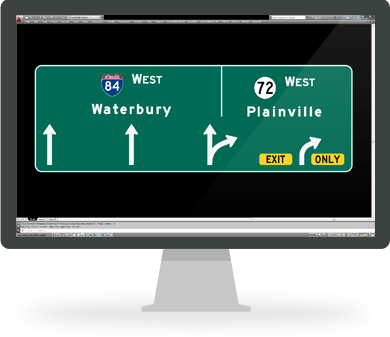 Virtually any highway and roadway sign can be created according to guidelines making this release the most powerful to date! The GuideSIGN demo is a fully functioning program. Please note that a few elements have been modified and some functionality has been limited. However, the demo should provide you with a good representation of what the software can do and how it can be applied. The demo should not be used in actual design or project work. There was a problem with the form submission. Please try again or email webmaster@transoftsolutions.com for assistance. Save the demo application to your computer's desktop. Double click the file to start the program and follow the onscreen instructions. Follow the steps to complete the installation. You are now ready to begin working.